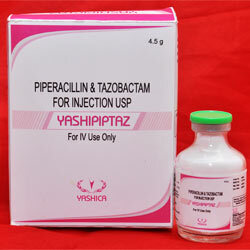 Best quality of Yashipiptaz is offered by us to patrons across the India. This Yashipiptaz is contains Piperacillin sodium equivalent to 4 grams of Piperacillin and Tazobactum Sodium equivalent to Tazobactum 0.5 grams. it helps to reduce the development of drug-resistant bacteria and sustain the effectiveness. It act as an effective broad spectrum antibacterial agent in injectable antibacterial combination form that consisting of the semisynthetic antibiotic Piperacillin sodium and β-lactam Tazobactam. Piperacillin, a broad spectrum, semisynthetic penicillin exerts bactericidal activity by inhibition of both septum and cell wall synthesis. Tazobactam, a beta-lactam structurally related to penicillins, is an inhibitor of many beta- lactamases, which commonly cause resistance to penicillins and cephalosporins but it does not inhibit AmpC enzymes or metallo beta-lactamases. Tazobactam extends the antibiotic spectrum of Piperacillin to include many beta-lactamase- producing bacteria that have acquired resistance to Piperacillin alone. Yashipiptaz is administered by intravenous injection (over 30 minutes). The dose and frequency of Yashipiptaz depends on the severity and localization of the infection and expected pathogens. For Infections: The usual dose of 4g piperacillin /0.5g tazobactam is given every eight hours. For nosocomial pneumonia & bacterial infections in neutropenic patients: Recommended dose of 4g piperacillin /0.5g tazobactam is every six hours. This regimen may also be applicable to treat patients with other indicated infections when particularly severe. For patients on haemodialysis, one additional dose of piperacillin/tazobactam 2g/0.25g should be administered following each dialysis period. No dose adjustment is required for the elderly with normal renal function or creatinine clearance values above 40 mL/min. Children: YASHIPIPTAZ is not recommended for children below 2 years age. Piperacillin/10mg tazobactam per kg body weight, every six hours; not to exceed the maximum 4g /0.5g per dose over 30 minutes. Complicated intra-abdominal infections: 100mg piperacillin/12.5mg tazobactam per kg body weight, every eight hours; not to exceed the maximum 4g/0.5g per dose over 30 minutes. Creatinine Clearance = 50 mg/mL: 70mg piperacillin/8.75mg tazobactam per kg body weight, every eight hours. For children on haemodialysis, one additional dose of 40mg piperacillin /5mg tazobactam per kg should be administered following each dialysis period. Yashipiptaz is contraindicated for patients with hypersensitivity to piperacillin and/or tazobactam or any other penicillin-antibacterial agent, history of acute severe allergic reaction to any other beta-lactam active substances (e.g. cephalosporin, monobactam or carbapenem). Before initiating therapy with piperacillin/tazobactam, careful inquiry should be made concerning previous hypersensitivity reactions to penicillins, other beta-lactam agents (e.g. cephalosporin, monobactam or carbapenem) and other allergens. Serious and occasionally fatal hypersensitivity (anaphylactic/anaphylactoid including shock) reactions may occur in patients receiving therapy. These reactions are more likely to occur in persons with a history of sensitivity to multiple allergens. Serious hypersensitivity reactions require the discontinuation of the antibiotic, and may require administration of epinephrine and other emergency measures. Antibiotic-induced pseudomembranous colitis may be manifested by severe, persistent diarrhoea which may be life-threatening. The onset of pseudomembranous colitis symptoms may occur during or after antibacterial treatment. In these cases piperacillin/tazobactam, should be discontinued. Therapy with piperacillin/tazobactam may result in the emergence of resistant organisms, which might cause super-infections. Bleeding manifestations may occur in patients receiving beta-lactam antibiotics. If bleeding manifestations occur, the antibiotic should be discontinued and appropriate therapy instituted. Leukopenia and neutropenia may occur, especially during prolonged therapy. Therefore, periodic assessment of a full blood count should be performed. As with treatment with other penicillins, neurological complications in the form of convulsions may occur when high doses are administered, especially in patients with impaired renal function. This medicinal product contains 9.44 mmol (217 mg) of sodium per vial of powder for solution for infusion. To be taken into account by patients on a controlled sodium diet. Hypokalaemia may occur in patients with low potassium reserves or those receiving concomitant medicinal products that may lower potassium levels; periodic electrolyte determinations may be advisable in such patients. Non-depolarising muscle relaxants: piperacillin when used concomitantly with vecuronium due to their similar mechanisms of action, it is expected that the neuromuscular blockade produced by any of the non-depolarising muscle relaxants could prolong the presence of piperacillin. Oral anticoagulants: during simultaneous administration of heparin, oral anticoagulants and other drugs affecting the blood coagulation system including thrombocyte function, appropriate coagulation tests should be performed more frequently and monitored regularly. Methotrexate: piperacillin may reduce the excretion of methotrexate; therefore, serum levels of methotrexate should be monitored in patients to avoid substance toxicity. Probenecid: as with other penicillins, concurrent administration of probenecid and piperacillin/tazobactam produces a longer half-life and lower renal clearance for both piperacillin and tazobactam; unaffecting peak plasma concentrations of either substance. Aminoglycosides: piperacillin, either alone or with tazobactam, does not significantly alter the pharmacokinetics of tobramycin in subjects with normal renal function and with mild or moderate renal impairment. The pharmacokinetics of piperacillin, tazobactam and the M1 metabolite are not significantly altered by tobramycin administration. The inactivation of tobramycin and gentamicin by piperacillin may occur in patients with severe renal impairment. Vancomycin: No pharmacokinetic interactions occur between piperacillin/ tazobactam and vancomycin. Effects on laboratory tests: piperacillin/tazobactam therapy may lead to false-positive results for urinary glucose by non-enzymatic methods, urine protein by chemical measurement methods. Protein measurement with dip sticks is not affected. The direct Coombs test may be positive. Symptoms include nausea, vomiting, and diarrhoea. In the event of an overdose, piperacillin/tazobactam treatment should be discontinued. Treatment should be supportive and symptomatic according to the patient's clinical presentation. Excessive serum concentrations of either piperacillin or tazobactam may be reduced by haemodialysis. One vial containing white to off white, highly hygroscopic powder for injection and 10 mL Water for Injection. Reconstituted and/or diluted piperacillin/tazobactam 4g/0.5g Powder for Injection should be used immediately.